It is said that the definition to insanity is to try the same thing again and again, and expect a different result. If that is the case, I can think of nothing more insane than how small and mid-sized companies (SMBs) approach the recruitment, training and managing of their sales teams. Despite consistent underperformance and disappointment, executives continue to hire the same types of people, ask them to do the same things, and then complain when they fail to perform. 76% of salespeople are failing. 52% of salespeople fail to make quota. The mishire rate for hiring salespeople is higher than any other function in business. The underlying reason for all of this is highlighted in a study conducted by Forrester where they asked executives to grade the salespeople they encounter on several factors. 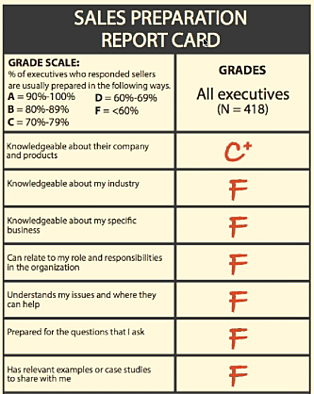 The only passing grade given was for company and product knowledge - and that was only a C+! An "F" was given for every other aspect. It's no wonder customers and prospects would rather figure everything out for themselves before even considering talking with a salesperson! The bottom line is that the way companies buy today has undergone a complete transformation, and sales organizations are woefully behind aligning their approaches to match the new world. If you're looking for a place to start, the recruitment and ongoing management of salespeople is a great place to begin. For years, SMBs have been attempting to hire the same type of salesperson. The typical recipe involved mixing relevant experience and "track record", with an extroverted personality, and a go get 'em attitude. Oh yeah, if they've got a "book of business" then that's a bonus. Support them with an e-blast, some loose marketing and wait for the sales to arrive. Then repeat the process 12 - 24 months later, when the rep "fails." I've seen this approach rolled out so many times, that I actually feel a little nauseous when I'm talking to a prospect who's telling me that they're about to hire a salesperson. The net result is a bunch of peddlers working hard, commoditizing the company and frustrating customers. While Forrester's report card was no surprise to me, it's time that we all admit the traditional approach to hiring and building a sales team has failed, and it's time to bury it. To drive consistent, predictable growth going forward, business, sales and marketing executives must follow a new playbook, redefining the traits of a successful salesperson, the competencies they assess and the approach/system they put their salespeople into. Business Acumen: I've been shouting this from the mountain tops for 10 years now. Salespeople no longer provide any compelling value to their customers. Instead, we must become "business people who sell." Your sales team needs to understand their customer's business as well (and in many cases, better) than your customer does. Empathy: The world is filled with salespeople (and executive teams) who don't understand your customer's roles and challenges. Research shows that in competitive situations, "once access to the right buyers is gained, the winning advantage almost always goes to salespeople who deeply understand buyers’ roles and relevant business challenges and how to help the buyers solve them." Teaching: This is an often misunderstood concept when assessing salespeople. It's easy to confuse presentation skills with the ability to teach. While the skills are aligned, they are not the same. The ability to teach requires a certain temperament and adaptability that many salespeople lack. Sales extroverts often have problems teaching. Instead of searching for extroverts, look for ambiverts. The reason your sales efforts aren't producing consistent, sustainable results is because your sales system is designed for inconsistent, disruptive, below par results. Think about it, if your manufacturing line was producing consistent inconsistent results, would you blame staff motivation? No! You'd realize that there is something wrong with the system and you'd get to work on changing it..fast! As I've shared before, there are many companies that have accepted this truth. They've adjusted their sales approach to align with how customers make decisions, they've built the lead generation and management processes that allow for consistent growth, and they've implemented a sales approach designed for a world where the customer controls the process. Predicting success is actually quite simple. It's one part effective process/system, one part the right people for that system and then you allow it to bake for the appropriate time. The meal is not only enjoyable, it's quite profitable as well.